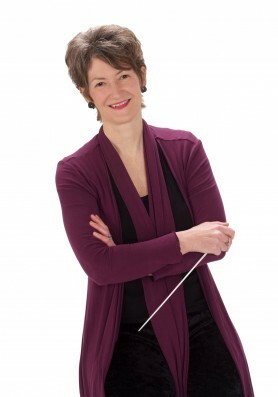 Sarah Tenant-Flowers studied music at Oxford and Durham Universities and conducting with Sir Charles Groves, Peter Erdei from the Liszt Academy, Laszlo Heltay, and Alan Hazeldine. The numerous choirs, both British and overseas, with which she has worked include the Cape Town Philharmonic Choir and Orchestra, the Kantorei der Friedenskirche of Düsseldorf, Cardiff Polyphonic Choir, Reading Bach Choir, Reading Festival Chorus, Nottingham University Choir, Guildford, Croydon and Sevenoaks Philharmonic Choirs, English Baroque Choir and Harlow Chorus, one of the UK’s most innovative amateur choirs. Sarah is currently artistic director of professional choir Singscape which specialises in multimedia collaborations and contemporary repertoire, Principal Conductor of chamber choir NC3, Associate Music Director of the Brandenburg Sinfonia, co-director with Janet Lincé of Encoro chamber choir, a teacher at the Royal Welsh College of Music and Drama and on the council of the Association of British Choral Directors. Sarah maintains a particular interest in Russian Orthodox and contemporary choral music, has commissioned widely and conducted many UK and world premieres. She is a regular judge for the annual BASCA composer awards. Orchestras and period ensembles with which she has worked include the Britten Sinfonia, City of London Sinfonia, City of London Chamber Players, Hilliard Ensemble, Ensemble Bash, Fiori Musicali and the Alberni and Brandenburg Symphony Orchestras. Sarah is a popular workshop leader with Britain’s choirs and leading choral organisations including the Association of British Choral Directors (ABCD), an organisation which she helped to establish, Sing for Pleasure (SfP) and Making Music. She teaches choral conducting, both privately and for the Royal Welsh College of Music and Drama, as well as for ABCD and SfP, and works as an adjudicator for choral festivals including the Leith Hill Music Festival and Dublin’s Feis Ceoil. Former arts management posts include administrator of the Menuhin International Violin and televised Choir of the Year Competitions, Artistic Director of Music at Oxford, and General Manager of The Sixteen conducted by Harry Christophers, with whom she has worked worldwide. In 2008 Sarah made her debut with Ireland’s National Chamber Choir in a broadcast performance of Pärt’s Passio with the Hilliard Ensemble for RTÉ’s Living Music Festival. In the same year she also featured as conducting mentor to actor and comedian Bradley Walsh on BBC2’s popular TV series ‘Maestro’ and has subsequently worked with Blur guitarist Alex James. Sarah has broadcast several times on BBC Radios 3 and 4 and records regularly for Classical Communications. Forthcoming projects include performances of Brahms and Rheinberger, Mahler’s Resurrection Symphony in Nottingham, the recording of works by Bernard Rose, Howells and Vaughan Williams, a Christmas concert with the English Baroque Choir and the Brandenburg Sinfonia at St Martin-in-the-Fields, London in December, a performance with His Majesties Sagbutts & Cornetts, and the launch of new professional female vocal ensemble Papagena at London’s National Portrait Gallery next spring.